The art of "glove puppetry" appeals to young and old alike; it's so popular in Taiwan that they say "everyone knows about it." 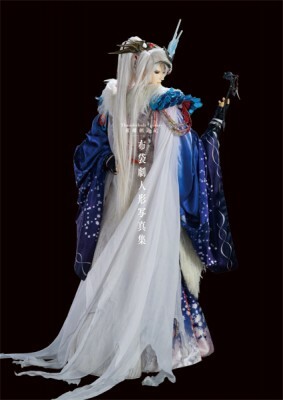 Gen Urobuchi has immersed himself in every aspect of the Thunderbolt Fantasy: Sword Seekers production, creating the premise, script, and even acting as the supervising director of this action-packed puppet drama. Reaching a shocking final episode in September 2016, but with a second season already under production, we present this photo collection to provide fans with an even deeper appreciation of the art. Featuring not only a selection of photos mid-drama, it also has all-new photos of the 14 major players starring in season one. Luxuriant and beautiful, this is Japan's first-ever full-color glove puppet photo collection, produced solely by Nitroplus. With an indulgent 100 pages! Enjoy and appreciate an all-new side of Thunderbolt Fantasy: Sword Seekers. ・This product will be available for advanced purchase for Dec. 29-31, 2016 at Comic Market 91 (Price: 2,500JPY). Please keep in mind that we do not accept order cancellation. ・Please refrain from contacting the Nitroplus Online Store with Comic Market 91 related inquiries.